When you use our client portal, we want you to have the best experience possible. That’s why we developed our technology ourselves. No other company in the employee screening industry has anything like it. And we’re committed to making sure you get exactly what you want from it. 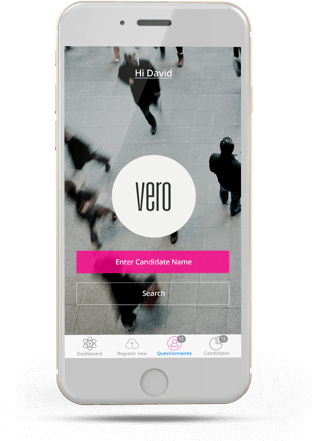 Candidate data is accessible in an easy-to-use, highly visible format and our distinctive screening wheels give you an at-a-glance view of each candidate’s progress. We adapt and integrate our systems to meet your needs and continuously monitor industry developments. To help clients who are on the move, our portal has been optimised for use on a wide range of devices including PCs, smartphones and tablets. 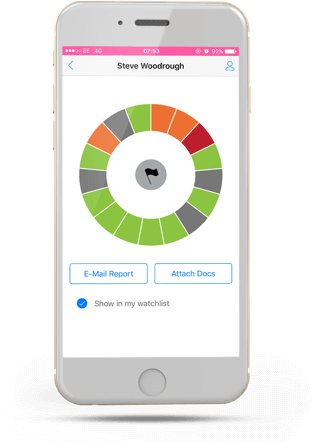 Our app will send alerts and updates and our portal generates a full audit trail. This means you can track the whole process, from start to finish. 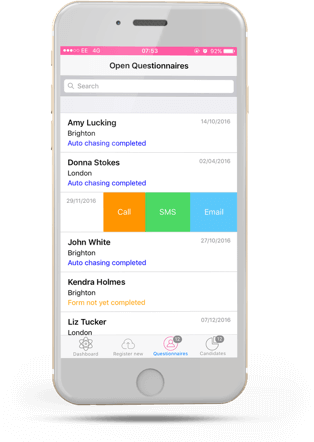 Track candidate progress and prompt them to submit their questionnaires with easy access to call, SMS and email. Our service is closely tailored to your needs. We don’t believe in an off-the-shelf client or candidate experience. And that’s why we don’t use off-the-shelf employee screening technology. Vero’s systems are built and maintained in-house, by our team of developers. We proactively adapt our systems to meet your specific business needs. When you work with us, we make sure you have all the information you need to manage your candidates and your relationship with us. Key performance metrics are at your fingertips. We’ll support you in identifying trends and issues within your onboarding process, and if there’s something you want to track that isn’t currently covered by our reporting system, our development team is there to help. We understand your candidate’s experience of the screening process forms part of their first impressions of your company. So, we do everything in our power to make that experience a positive one – aligned with your brand. Our online screening questionnaire has been designed to gather information quickly and accurately and we’ve designed our interface to be easy to use on a desktop or mobile.